Soooo… Let YOUR inner whimsy fly! List five characters, creatures, things or feelings YOU’D like to do the next time you have the opportunity to be in costume. Will you be biblical, Disney, vegetable, or historical? Will you make a political statement or just live out a fantasy? do tell! I always struggled to come up with “cool” costumes. One year I decided to be a sandwich for Halloween. I dont remember much about the costume but remember that I tied two pillows to myself to make the bread. Looking back on it….it was pretty lame costume. As I’ve gotten older I have actually had a lot of fun thinking of costumes. When I was at seminary, there was always a Halloween party for the kids and they would trick or treat through the dorms. I loved that. 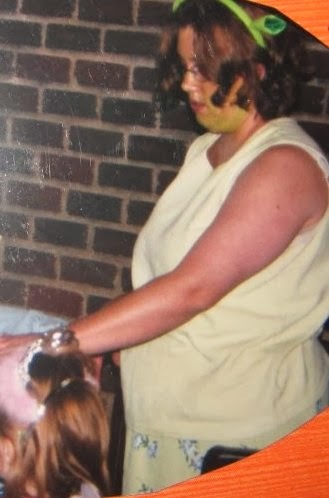 I found some Princess Fiona ears at store and so I painted my face green and was Princess Fiona for Halloween. It is one of my fave costumes. Probably because I saw how much joy it brought the kiddos! Another year I went as static cling! (1) I think it would be fun to dress up as Hermione from Harry Potter. I love the books and just think it would be fun to dress up as one of the characters from the book. (2) NEMO! 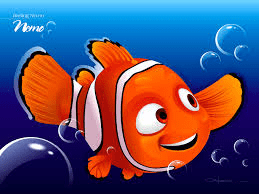 I love the movie and think it would be incredibly fun to go as Nemo from the movie. I haven’t seen many Nemos so it would totally be out of the box. 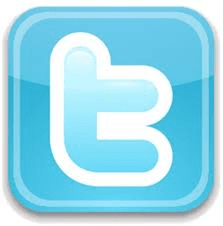 (3) In this world of technology, I suppose it would be rather clever to go as a Facebook page or Twitter feed or something like that. 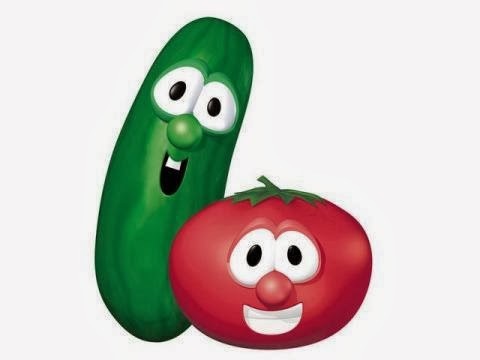 (4) One of the Veggie Tales would be so much fun! (5) I cant think of any others? What are your best costume ideas? As a child, I really wasn’t that fond of riding on roller coasters. But as I got older and as friends promised to hold my hand, I finally mustered up the courage to ride on a roller coaster. To be honest, I actually now enjoy a good roller coaster ride. There is something incredibly great about raising my hands up in the air as we travel around each curve, over each hill and then down each hill. Lately my life has felt like one great big roller coaster ride. I’m in the midst of a transition as I leave a place that has incredibly blessed my life and get ready to go to a new place. I’m excited for this new adventure but I’m also sad to leave behind the relationships and the place that has made me into the woman leader that I am today. And that, my friends, is why I feel like I’m on a giant roller coaster. I am jolted from my seat every time we hit a huge bump. I feel every moment of the deep valleys and high mountains. I feel every moment of extreme excitement and every little bit of fear. But in the end I’m glad I got on the ride in the first place. I’m glad that I have let myself give in, raise my hands in the air, and experience the pure joy especially after the fear and doubt I felt as I got on the roller coaster. I know I haven’t posted a Sunday Blessings in awhile but thought I would bring if back this week! What are your blessings this week? (6) Seeing one of my fave ladies I used to do Zumba with and having her congratulate me on this new call. (7) FB. I know how can FB be a blessing? But this last week it truly has been–the messages, notes etc about my call. It is such a blessing to hear so many are praying for me, DLC, etc in the midst of this transition. (10) Having lunch with two of my fave people on Friday. (12) Texts with a dear friend who is a total blessing in my life. We even helped each other with each other’s sermons. (13) And YOU! Each of you are a blessing in my life this week! Love you all!! List five triumphs – they can be professional (grew a youth program from 0 to 60 in 2 years) or they can be personal (she said yes). You can do a quick list or you can elaborate. They can be little (I avoided the office candy jar this week) or HUGE (I had to grind it out, but eventually I passed all of my ordination exams). It’s totally up to you. And if you’d like a bonus question: give us a fail (hmmmm) – but you don’t have to do that one if you’re too busy being triumphant. (1) Finally getting my Driver’s License–It was right before I went to college. When it came time for my mom to get her driver’s license, her dad and her were almost in a bad accident which scared her. Mom never got her license until she was in her 20s. I was nervous too so it took me a little while to get my license too. (2) Graduating seminary. It is one of my most blessed and triumphant experiences. To this day, I am so glad I stuck with it even when it was so difficult. It was also the first time I was more than a couple hours drive away from my family and friends! (3) Having my first poem published in a poetry anthology. So cool!!! I have had a few poems also published in some publications like the seminary’s newsletter the Persistent Voice. (4) Learning Zumba and sticking with it. I may not be the most coordinated person but it is something that I LOVE doing. I also have shed some pounds because of it. I am so close to being under 200 pounds and I cannot remember the last time I was under 200…probably in jr high or high school. (5) Professionally I have been blessed to serve at DLC. One of my triumphants there has been adding my own milestones that werent already part of their list of milestones. I love teaching the Faith Milestones and love that it helps equip homes and families to pass on faith and values! BONUS: The one failure I immediately think of ties to my seminary experience of being triumphant. When I was at seminary, I really struggled with Systematic Theology. In fact, I took it three times. 🙁 The third time one of my professors realized I was an auditory learner so we did an independent study. We recorded our conversations and then I would go back and listen to them. At the end of the session, he asked me to bring in some friends and they got to share with me how I had grown. It was so cool. I am so thankful for Winston. I also am thankful for my seminary advisor Nate who supported me throughout my journey. I remember sitting in my endorsement interview where my candidacy committee asked me, “Why I had struggled so much with systematics etc?” I answered. I remember Nate saying, “Do you know how easy it would be for Tara to walk out that door, shut the door, and never look back? It takes more guts to stick with it.” Those words have stuck with me! Just the other day a friend posted a fun little meme on FB. I commented on her status and got my own letter…the letter B! The meme asks what word beginning with the letter you are given (in my case the letter B) reminds them of me! I got words like babysitter, busy, bubbly, beautiful and BRAVE! Immediately I thought yes, I am busy. And yes I am bubbly. And yes I am beautiful…in my own ways! And yes I have definitely been a babysitter. But brave….that one threw me off a little! Why did/does my friend think of me as brave? When I think of brave, I think of those who daily battle with an illness. When I think of brave, I think of my Special Olympics friends! When I think brave, I think of my friends who have lost children…or a spouse! When I think brave, I honestly think of anyone but myself! But yet that is the word that my friend used to describe me. So I’m curious, my dear faithful readers, what makes me brave?!? Today’s Friday is about babies. Tell us about babies in your life, of all kinds, even ideas! 1. babies of family or friends–Shout out to my friends L and B on their new baby girl M. Also shout out to my friends J and C on the birth of their new son D. And a third Shout to GirlWithBlog and her Husby on the announcement that they are expecting again. Anyone who knows me knows that I LOVE babies. I am so ready to have babies of my own. Either I need to find my Mr. Right OR I need to simply adopt or do foster care. I love buying baby gifts for all my friends and families and their little ones! Babies are oh so sweet and remind me of the beauty of God’s creation. 2. animal babies–Baby calves. I love bottle feeding baby calves. I miss getting to do this more often than I do. Baby kitties. Baby monkeys. Any baby animal gets me! 3. babies you remember in movies or on tv–The twins born to Jesse and Rebecca on Full House. The current babies on Greys. Lots of babies seen on America’s Funniest Home Videos. Babies seem to be all over the place on tv and on movies when you think about it! 4. babies in the Bible–So many but the one that immediately sticks out in my head is Baby Jesus! 5. anything that may be a “baby” arising in your own life–Hmmm….I’ll have to think about this one! There are times when I feel like I’m just throwing words onto this blog and opening myself up for all the world to see; utter and complete vulnerability. Why is it so much easier to let it all out here instead of in person? Sometimes I wish I had the guts to speak what I’m thinking and feeling out loud! Just some thoughts rumbling around in my head tonight! (1) Just because I love you flowers from a dear friend! Thanks for brightening my day, my friend! (8) The ability to upgrade my phone. I’m sporting the new IPhone 5c now. (9) Writing down words to help me sort through life.